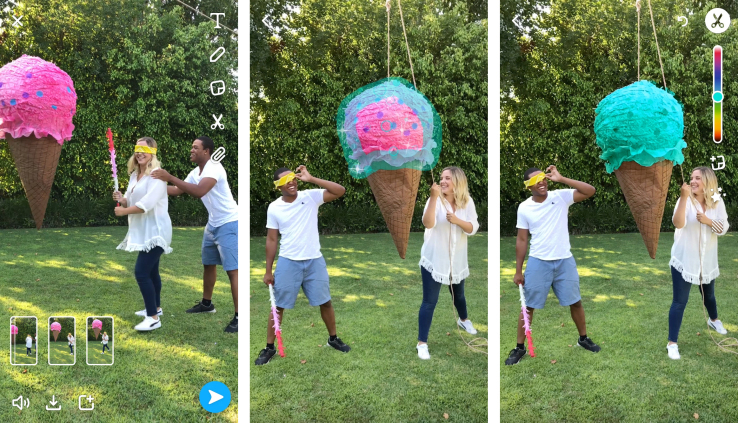 Snapchat is rolling out a couple of features including the ability to record multiple 10 second snaps continuously and a Tint Brush that will allow users to change colors of specific objects or areas in the snap. The Multi-Snap feature will be for iOS users at first only and will then be launched later for the Android users. The Tint Brush is however being launched for both categories. The Multi-Snap feature is a great addition and will help improve the overall Snapchat experience. All you have to do is hold down the record button instead of trying to guess the timing and doing a repeated tap and hold. You can record and post up to six 10 second clips that can be decorated with Snapchat’s other tools and filters. Pretty cool right? The snaps in the sequence can also be deleted so you don’t necessarily have to post the entire thing. You can choose your favorite ones but they will always post in a chronological order. Snapchatters now can have 60 second posts (six 10-second clips captures continuously and posted in sequence) and this will change the entire viewers’ experience. If you have used color replacement or tinting app before then you would be familiar with what the Tint Brush feature of Snapchat basically does. Highlight the parts you wish to change with the help of this feature by just choosing the desired color and highlighting the area you wish to change. You highlight it by outlining the area with your finger. You don’t have to be exact about the outlining as machine learning will select the likely area and fill in the color. It will still preserve image details in the process. As Snapchat continues to add more and more features to its application, competitors are always at a loss. Well, unless of course they just copy the entire thing.